Koi fish are a group of fish that originated from domesticated common carp (Cyprinus carpio). Common carp was known for their various colors many centuries ago in their natural habitat in Asia, most notably China. They were later selectively bred for color in Japan, hence the name koi fish (Japanese koi fish), as they are known today. There are many different varieties of koi fish that vary in color, size, pattern, and type of scales. Simply put, koi fish are one of the most beautiful pond fish available. They have become so popular in the past century that they can now be found in ponds all across the world. Those who keep koi fish know how delicate and important it is to maintain their living environment. 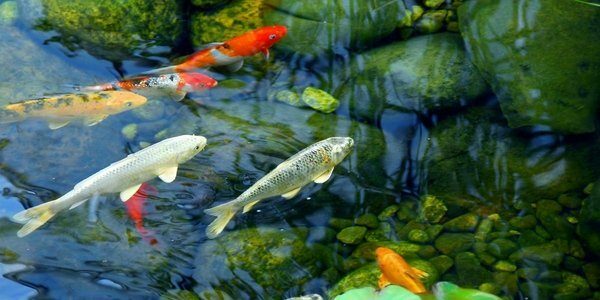 As with every fish, an aquarist should understand all the basic necessities and requirements of koi fish. Koi fish can grow really, really big. The size they can grow to is determined by various factors, especially the environment they live in. If their habitat is well maintained, koi can grow quite large and also a lot healthier, living anywhere from 25 to 30 years. Exceptional koi can live for well over 100 years and the foundation on which everything else is built is a proper-sized pond. The ideal pond size for keeping koi should hold at least 1,000-gallons of water. The very important thing when planning the size of your pond is the depth of water in it. Koi should be kept in at least 3-foot deep water to help your koi find cooler water in the summer and warmer water when it is cold. One thousand gallons of water should provide enough space for five koi fish, if all water parameters are correct. One of the most important things to keep in mind is the bottom of your pond should not be covered with hard gravel or rocks. Most koi fish enthusiasts use a completely smooth bottom or fine gravel. This is practical because koi spend most of the time at the bottom of the pond when it is cold. The deeper they rest during winter months, the warmer the water for them and when staying deep, they often make contact with the bottom surface. If the surface is too hard, it can injure their soft bellies, which can lead to a serious infection or even death. Koi fish are known for their ability to survive in a wide range of water temperatures. Koi are moderately cold resistant, as they can survive temperatures in most climates. However, like most species, they cannot tolerate sudden temperature changes. In cold weather, they should generally be able to survive easily as long as the depths of the pond do not freeze. Large portions of the water surface should also be open for gas exchange within the pond. During the summer, consider providing a shadow for the pond if it is not deep enough for your koi to keep from being exposed to direct sunlight. Keeping your water in great shape is particularly important when it comes to keeping koi; they need great conditions in order to thrive and reach their full potential. One of the most important things when keeping koi is to make sure they have enough oxygen at all times. Setting up a waterfall or a fountain is a great idea to supply oxygen and also make your pond even more vivid and beautiful. During summertime, koi fish eat much more and the levels of oxygen needed are much higher. Keep this in mind when making the transition from season to season. Proper water filtration is also very important for the well-being of your koi. Unhealthy water conditions are considered to be the number one reason for koi death. Simply, the water quality is the single most important factor when keeping all fish species. Always make sure your water is properly filtrated, well oxygenated, and all waste is cleared from the environment. Be aware of your fish’s exact needs at each time as they can change due to number of fish, maturity, and temperature. Expert aquarists advise koi keepers to use high-volume filters to save time and effort. Ideally, your pond should have a bottom drain for easier cleaning and water changes. Koi are kept because of their brilliant color and the way they play around. Their pigment and overall health is very much impacted by the way they are fed. If you feed them properly, you will have great results, but the most important factors to consider when feeding koi is the type and amount of food you give to them. There are many potential sources for koi feeding. Having that in mind, you should provide them a varied diet of different types of food. They are most commonly fed with floating pellets and sticks; however, they also like live food such as bloodworms and river shrimp. One thing you must not do is to overfeed your koi. There are several negative effects caused by overfeeding such as overweight fish polluted water as leftover food disintegrates at the bottom of your pond. Given this in mind, you should only feed you koi fish enough food to eat in five minutes. If there is anything left uneaten after feeding, make sure to give them less food next time. The food needed for your koi varies greatly depending on water temperature; they eat much more if the water temperature is higher, and vice versa. One thing to watch after is the safety of your koi, especially since they are known as notorious jumpers. Usually, when they jump out of the water, they get back in and stay safe, but sometimes they will just jump out of the water and if left unattended, they will surely die. The other thing you should be aware of is predators lurking for prey. You should consider installing a protective fence and bird nets to keep the koi safe at all times. With these great tips in mind, your koi fish will be happy and stay healthy, while reaching their full potential. Good luck and happy koi keeping!